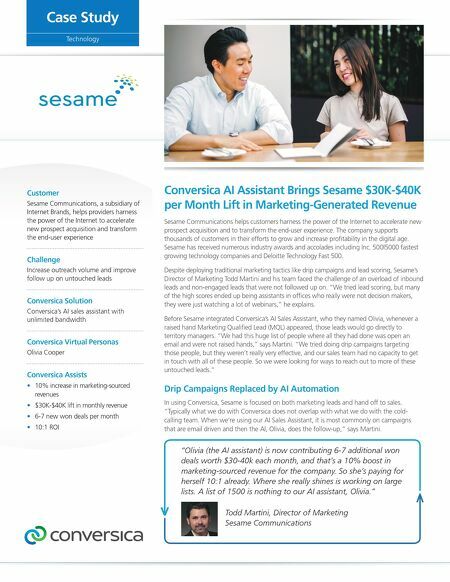 Conversica AI Assistant Brings Sesame $30K-$40K per Month Lift in Marketing-Generated Revenue Sesame Communications helps customers harness the power of the Internet to accelerate new prospect acquisition and to transform the end-user experience. The company supports thousands of customers in their efforts to grow and increase profitability in the digital age. Sesame has received numerous industry awards and accolades including Inc. 500|5000 fastest growing technology companies and Deloitte Technology Fast 500. Despite deploying traditional marketing tactics like drip campaigns and lead scoring, Sesame's Director of Marketing Todd Martini and his team faced the challenge of an overload of inbound leads and non-engaged leads that were not followed up on. "We tried lead scoring, but many of the high scores ended up being assistants in offices who really were not decision makers, they were just watching a lot of webinars," he explains. Before Sesame integrated Conversica's AI Sales Assistant, who they named Olivia, whenever a raised hand Marketing Qualified Lead (MQL) appeared, those leads would go directly to territory managers. "We had this huge list of people where all they had done was open an email and were not raised hands," says Martini. "We tried doing drip campaigns targeting those people, but they weren't really very effective, and our sales team had no capacity to get in touch with all of these people. So we were looking for ways to reach out to more of these untouched leads." Drip Campaigns Replaced by AI Automation In using Conversica, Sesame is focused on both marketing leads and hand off to sales. "Typically what we do with Conversica does not overlap with what we do with the cold- calling team. When we're using our AI Sales Assistant, it is most commonly on campaigns that are email driven and then the AI, Olivia, does the follow-up," says Martini. Customer Sesame Communications, a subsidiary of Internet Brands, helps providers harness the power of the Internet to accelerate new prospect acquisition and transform the end-user experience Challenge Increase outreach volume and improve follow up on untouched leads Conversica Solution Conversica's AI sales assistant with unlimited bandwidth Conversica Virtual Personas Olivia Cooper Conversica Assists • 10% increase in marketing-sourced revenues • $30K-$40K lift in monthly revenue • 6-7 new won deals per month • 10:1 ROI Todd Martini, Director of Marketing Sesame Communications Technology Case Study "Olivia (the AI assistant) is now contributing 6-7 additional won deals worth $30-40k each month, and that's a 10% boost in marketing-sourced revenue for the company. So she's paying for herself 10:1 already. Where she really shines is working on large lists. A list of 1500 is nothing to our AI assistant, Olivia."